status quo stuff about “men only” pastimes, and she passed that attitude on to me as well. 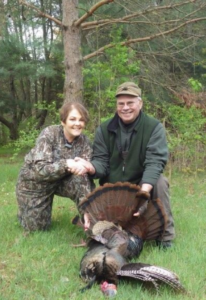 seminar involved every aspect of turkey hunting, with knowledgeable speakers oneach topic. This was followed by actual shooting at “turkey” targets. from the Cass City DNR Field Office, the shooting portion was performed there. centered on the turkey target, entailing the all important head/neck shot. opportunity happened for any of these ladies, a gobbler was going down. out to pre-selected areas, some on state land and some on private land. almost 50 years of turkey hunting I’ve developed some instincts which are purely gut-feelings which come out of nowhere and I can’t quite put it into words. know this was an occasion to really lay it on. straight up and I hissed “take him”, followed by the bark of Deb’s 20 ga.
without hesitation. She can be my hunting buddy anytime. 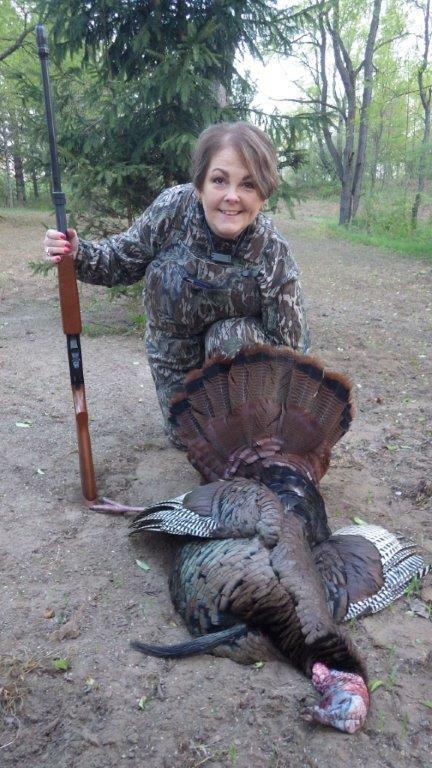 Her bruiser bird was DNR-aged at being a 4 year old gobbler, which is a definite trophy in my book. by Jeanette Rousseaux of Port Austin, who was mentored by Ron Sting.